Do you need to remind your kids to be nice when they are naughty? 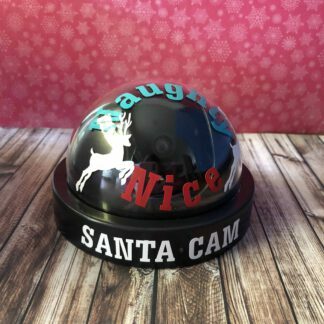 This fake Surveillance camera might help keep them “in Line” and add a bit of Christmas magic to your home. Place on a shelf in your house and insert the batteries, the camera will flash. Tell your kids Santa is watching and he knows what you are up too! Would work well with your elf if you have one. Upon request the camera can be personalised at the back with child’s name or family name. Type in comments at checkout what you require. Each Camera comes boxed with a note from Santa and batteries. There is no evidence (apart from a business sticker on bottom of box) that this parcel has arrived from us! After taking out the parcel from the postage bag let your children open the box to discover what’s inside! Please note this product is handmade with love and small variations may occur.